The only thing this game really gets right is having the word "Wiff" in the title. I had already cursed out Destination Software Inc. quite excessively before when the company completely screwed up the Game Boy Advance version of one of my favorite 16-bit shooters, R-Type III: The Third Lightning. Seriously, how hard is it to put a port of a classic game into play on another system? Apparently, real damn hard if you're with that team. The game suffered from every imaginable problem, like slowdown, sluggish gameplay, and pure lack of enjoyment. I thought that DSI would never really reach a lower point than that. Well, kids, I was wrong. Let me introduce you to the utter crap that is Wiffle Ball. 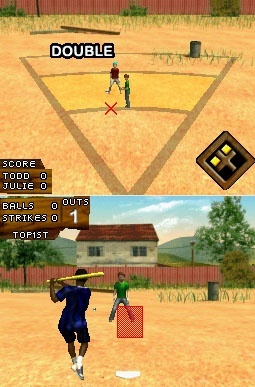 This game tries to emulate the "softer" version of baseball, with its modified rules (2 outs instead of 3, 7 innings instead of 9) and balanced ethics for kids. Of course, saying that it tries to emulate the sport and then watching its attempts to do so are two completely different things. See, the first part of the quote implies that effort has been put into the game...and that's simply not the case. The gameplay falls flat on its face. 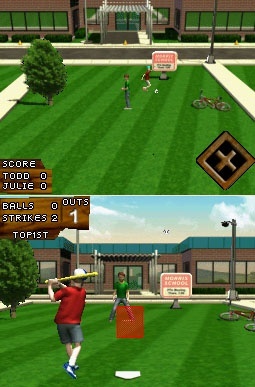 Players can either use the stylus or the A button to time their pitches or batting, and neither of them really feel balanced at all. Players merely have to hold down the batting button and try to hit the ball with perfect timing, and the pitching becomes even less complicated, since pitchers can pretty much lob a ball across the plate every time. It's almost depressing enough to make kids give up the real sport of wiffle ball and take up politicking instead. You know, going around and talking about how much they love Ted Kennedy. Please, don't let them sink to that level. The game does have three modes, but, really, they're all basic. Players can hop into a quick match, drag themselves through the mud with a terrible Season mode, or try to take a friend down with them in multiplayer. HA! The game doesn't even have any kind of downloadable solo cartridge play, which means that another sap with the cartridge has to be found in order to enjoy it. You'd probably have better luck trying to locate Waldo in a book with completely black pages. Worse yet, Wiffle Ball's presentation never feels alive in any way. Player animations look hapdash and unfinished, particularly the pitcher, who looks like he's going to break out in a convulsion. The appearance on the field...well, gee, it looks like a field. Nothing great there. As for sound, er, what sound? You've got a small piece of music that repeats each time and some of the quietest sound effects ever heard in a sports game. Are you serious? Where are the cheering fans or the drunken coach who wishes he had a better life, cursing himself on the sidelines like Billy Bob Thornton in Bad News Bears? This game has NO effort put into it at all -- it almost feels like a project put together by the lower-end bunch of a computing class. Even at a $20 price, it's still not worth it. The best value to come with this piece of garbage game is the inclusion of an actual bat and ball, if it's picked up through Best Buy. Suckers who end up purchasing this game, unable to take it back, can at least get a benefit out of it by beating the living crap out of it with the bat and then going outside with their kids to play the real thing. Really, DSI, you should know better than this. Wake up and make a good game for a change, will you? What's Hot: Er, um, it comes with a bat and a ball at Best Buy. What's Not: Everything else. Lame presentation; No comprehensive gameplay; NO FUN.